The Micro rocketed to the million-dollar mark in less than 24 hours, and is rounding on two million in just two days. The Micro is priced to move: $299 gets you the hardware, the software, and a filament spool so you can start printing right away. It’s clear from the project page that M3D team has a serious interest in delivering quality designs. Moreover, they have one of the better project plans I’ve seen, clearly identifying benchmarks and milestones for all to see—what I wouldn’t give for some of my other projects to be so transparent about how they envision their process unfolding! Now, I confess that I won’t be backing this one for more than a symbolic dollar—even with the compact form factor, I have space considerations, and I’m not convinced that my cats won’t just eat the filament and make colorful 3D objects of their own… That said, this is the kind of disruptive product I like to see hit the scene: a cool device that isn’t trying to be all things to everyone, but instead, seeks to socialize a seemingly fringe technology as widely as possible. 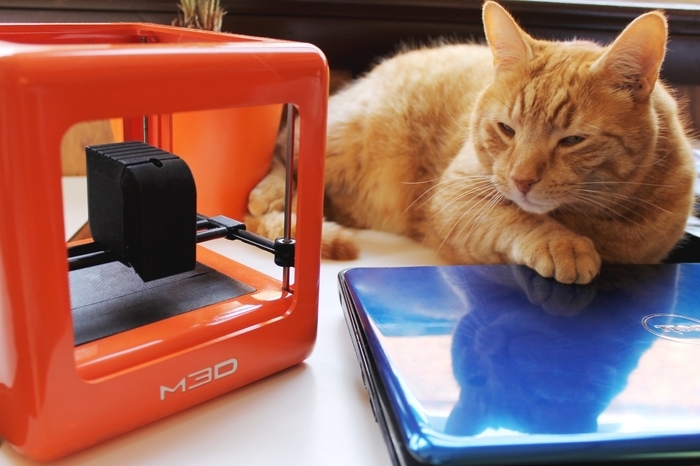 While the price point has lead some Redditors to question whether M3D’s goals are reasonable or even achievable at the $300 mark, the project page makes it clear that they’re giving backers a break. Still, even if they go-to-market price is $100 more, that puts the total price right in the range of a current gen gaming console—totally accessible to the scrap booker or hobby shopper who wants to bring a custom element into their craft. It’s an expensive toy… but no more expensive than other expensive toys. It’s also aesthetic and usable in a way that other, similar projects haven’t been, giving the Micro greater mass appeal. In my mind, the Micro project is crowd funding at its best: clear messaging, an innovative product, and a well-developed plan—the triumvirate of success. I think that not only will M3D break crowd funding records with the Micro, but that it will be a commercial success as well, once their infrastructure is in place. In the long run, this may well be the product that successfully moves 3D printing out of the maker/geeky space and into the mainstream. Now, what’s the over-under on a Facebook acquisition in 2015? Anybody? Hello? Is this thing on? If it’s real, it’s awesome. $1.8 million after two days? That’s nuts. People are just jumping in without any consideration about whether the product is real, or if the project owners are truthful. Admittedly, it looks good on the face of it. Still…I think I’m willing to wait until it’s commercially available, even if it costs a bit more, before I decide I need one. I’ll let these folks be the early adopters who struggle with a shaky launch product.